Arena Financing City revenue bonds, City general obligation bonds, equity from Pettit family. Naming Rights Chicago-based BMO Harris Bank has �secured the naming rights to the Bradley Center as part of a new six-year sponsorship deal for $18 Million. The Bradley Center in Milwaukee, Wisconsin is a gift to the State of Wisconsin from Jane and Lloyd Pettit in memory of her late father, Harry Lynde Bradley. Bradley was a co-founder and chairman of the Allen-Bradley Company. 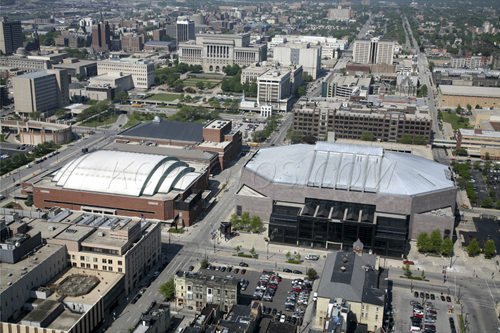 The Bradley Center is the only major, public assembly facility in North America with construction underwritten through the philanthropy of a single family. Its construction and continuing operation represent a gift to all the people of the State of Wisconsin. The Center opened in October 1988 and is the home of five sports teams: the NBA Milwaukee Bucks, the IHL Milwaukee Admirals, the Marquette University Golden Eagles men's basketball team, the NPSL Milwaukee Wave soccer team and the AFL Milwaukee Mustangs arena football team. The $90 million structure features glass-enclosed lobbies, three concourses, movable seats and accommodates both sports and non-sports events, such as concerts, ice shows and family entertainment, with minimal changeover time between events. CONSTRUCTION YEAR/PLANNING BEGAN: Planning of the Bradley Center started in 1985. Groundbreaking was October 20, 1986 and the Center opened to the public on October 1, 1988. TEAMS THAT USE THE BRADLEY CENTER AS THEIR HOME: IHL's Milwaukee Admirals, NBA's Milwaukee Bucks, AFL's Milwaukee Mustangs, NPSL's Milwaukee Wave, and Conference USA's Marquette University Golden Eagles Men's Basketball (NCAA); the Bradley Center also hosts the Bank One Badger Hockey Showdown and the WCHA Final Five in conjunction with the University of Wisconsin. DESIGN AND SITE ISSUES: The Center accommodates 18,600 guests for basketball, 17,800 for hockey/soccer, and 20,000 for concerts, with a total area of 550,000 square feet. From the top row to the basketball court, the distance is only 152 feet, with the suites only 76 feet from the court. There are 68 suites in the Bradley Center, all located on the second of three levels. Fans reach the three concourses via 16 escalators and two elevators. In addition, there are 12 concession stands, four merchandise stands, and 28 public restrooms. The arena houses separate team facilities for the Admirals, Bucks and Golden Eagles. The site is approximately six acres and is located across the street from and just north of the Wisconsin Center convention and meeting facilities scheduled to open in 1999. MARKET ORIENTATION: The five teams that utilize the Center represent about 135 dates, giving the Bradley Center a solid core of sports events. The size and seating capacity of the arena have helped it to attract both top touring talents and traditional family shows. The Bradley Center also gives Milwaukee an advantage in attracting national or international sporting events, such as NCAA basketball and hockey tournaments. INTERESTING FACTS AND FIGURES: The building weighs 79,000 tons, stands 149 feet high, and is constructed of 21,000 cubic yards of concrete and 1,500 tons of structural steel. The lead-coated copper roof covers approximately three acres and rises to 13 stories at its highest point. The Bradley Center has 24 entrances and exits with primary guest entryways located at each corner of the building. The northeast entrance on Fourth Street serves the Bradley Center Ticket and Administrative offices. The southeast entrance, also on Fourth Street, serves the Milwaukee Bucks Ticket and Administrative offices. The southwest entrance on State Street serves the Milwaukee Admirals Ticket and Administrative offices. Inside each lobby, double rows of concrete columns with polished granite bases rise almost 70 feet to support a spectacular skylight system. Granite is also used in the lobby floor and in the grand stairway that leads to the 200 Level, as well as the entire exterior of the building. The Bradley Center hosts approximately 200 events and 2,000,000 guests each year. The Center can accommodate up to 20,000 guests, depending on the event. The 200 (Lower) Level of the Center accommodates approximately 8,000 spectators and provides 23 rows of seats for hockey and 26 rows for basketball. The 300 Level features 68 private suites which accommodate up to 20 guests per suite. Each suite is equipped with a wet bar, refrigerator, telephones, private restroom, custom furniture, and cable television. The 400 Level of the Center seats approximately 10,000 spectators in 21 rows of seats. The first game played at the Bradley Center was an NHL Exhibition game with the Edmonton Oilers vs. the Chicago Blackhawks on October 1, 1988. Chicago's Denis Savard scored the first goal 8 minutes 5 seconds into the game; he flipped a shot over Oilers goalie Bill Ranford on a power-play goal. The Bradley Center is hard to miss. Located downtown, around the corner from the Mecca, the Bucks' earlier home, and occupying more than a city block, the arena's red-and-pink granite exterior is visible from several blocks away. Inside are two glass-enclosed atria with columns fashioned from the same granite used for the building's facade. Although the Buck's home is impressive, the same cannot be said for what goes on inside. The Bucks have struggled the past several seasons. Milwaukee's poor play and the subdued hometown fans combine to make the experience of going to a game somewhat underwhelming. Even when the decibels rise, the sound seems to get lost. Although the non-basketball entertainment at Bradley Center is not particularly noteworthy either, the local mascot, Bango - a buck with big antlers - is popular. A house band called StreetLife also does its best to get things going during the game. Rather than anticipating the basketball experience of a lifetime, you should expect a quieter kind of NBA evening. 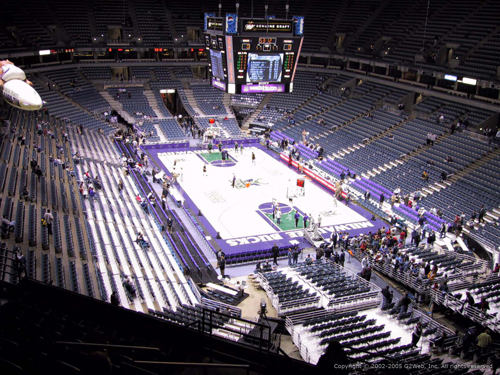 The highlight of your visit likely will be Bradley Center itself, a comfortable, well-built facility. The Bradley Center is located on the corner of Fourth and State Streets in Milwaukee. It covers more than a city block and is within walking distance of such luxury hotels as the new Hilton Hotel (formerly the Marc Plaza), the Wyndam and the Hyatt Regency, tournament headquarters for the Bank One Badger Hockey Showdown. With state-of-the-art engineering and technology, the Bradley Center features the integration of classic architectural elements. There are four dramatic entryways leading into the facility, one on each corner of the building. Each entryway is reached through a progression of visually exciting spaces: a tree-lined plaza, leading through an exterior portico into a 28-foot high, glass-enclosed vestibule, which opens onto a stunning 60-foot high, 17,500 square-foot lobby, also totally glass enclosed. Inside each lobby, double rows of concrete columns with granite bases rise almost 70 feet to support a spectacular skylight system. Two elevators, 16 escalators and various stairways take spectators to the seating area. Seating is comfortably arranged in an oblong octagon that provides spectators with an unrestricted view of the playing surface and the centrally located, four-sided video scoreboard. The first level accommodates approximately 8,000 spectators. The second level features private suites that encircle the arena and provide seating for nine to 12 people per suite. The third level seats approximately 10,000 spectators in 21 rows of seats. The Bradley Center has a total of 12 concession stands; eight of which sell traditional concession food and refreshments. The other four sell hamburgers, french fries, shakes, tacos, pizza pasta and other foods. Each stand is equipped with two to six closed circuit TV monitors. The Bradley Center is the site of the nation's premier collegiate hockey holiday tournament in the Bank One Badger Hockey Showdown. In the five year history of the tournament, over 200,000 fans have witnessed Badger hockey at the Bradley Center. Over 15 teams representing all four collegiate hockey conferences have taken part in the two-day event. Teams from Canada have also been part of the field. In 1993 the Bradley Center was the site of the NCAA Ice Hockey Championships. It was the most successful Final Four in NCAA history, drawing nearly 53,000 fans (an NCAA record for three sessions). The crowd of 17,704 for the NCAA championship game, set an NCAA hockey single-session record. Because of the remarkable success in 1993, the Bradley Center was awarded the 1997 NCAA Championships, which marks the 50th anniversary of the ice hockey championships. Bradley Center officials are cautiously sounding out political leaders about the possibility of attracting public funds to help renovate the 11-year-old venue that is the home of the NBA Bucks and the IHL Admirals. The issue is a sticky one after political leaders suffered harsh criticism in developing a financing plan for Miller Park, the new $400 million ballpark for the Brewers now under construction. The Bucks are hoping to get more revenue from the arena which is operated by a semi-private corporation. Arena officials are planning a $5 million renovation this summer which will add improvements to scoreboards, outdoor signage and similar features. A proposed $10 million project would add club seats, a restaurant and more concession stands. The venue has no club seats now. Another expansion could see the addition of a theater and retail shops. The center lost $2.3 million last year on revenues of $16.8 million. If there are surpluses, the money goes to the Bucks. The team pays no rent and gets $40,000 per game and 19% of luxury suite sales. They also get 27.5% of gross concession sales and 13.75% of gross suite catering sales. Advertising sales generate another $625,000 a year and the team gets 30% of merchandise sales. The Bradley Center board will add new video screens to its arena giving Milwaukee Bucks fans new views of the game and the team new revenue opportunities. The 13-foot by 23-foot screens will be at each end of the arena and are part of a $4 million investment by the board. The team hopes to add a restaurant, club seating and possibly retail offerings to the center. A committee is now studying possible changes to the venue, including an outdoor marquee. The NBA team would get all revenue from the new signs. A signage revenue now goes to the Bradley Center board, except for temporary signs erected by the teams that play there. The Bucks are also negotiating with six building partners for sponsorship programs. 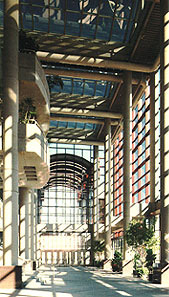 February 19, 2001 - The Bradley Center is not one of the spanking new arenas, yet incorporates many design features which are the norm today yet were cutting edge back in the 80s - multi concourses which are super wide, beautiful entry atriums on either side, food courts and separate suite levels. What immediately endeared us to Milwaukee was the striking resemblance that this city has to our own Buffalo - the skylines are similar; the city sits right along the lake, and you can get a definite feel of the ethnicity of the neighborhoods - particularly the German and Irish presence. One eventually gets the sense that the people here are very much like Buffalo people - gritty, hard working, blue collar types who know the meaning of a good days work and who are friendly and neighborly. We knew we would like it here and we were not disappointed. The Bradley Center is right downtown, and is the centerpiece of a bustling and diverse neighborhood which includes hotels, German bistros, sports bars and restaurants. Right next door is the older US Cellular Arena still open for smaller scale events. (That arena is better known as "The Mecca" back in the old days when guys like Robertson and Jabbar brought this city its greatest NBA moment). The Bradley Center is also home to the Milwaukee Bucks, Marquette University basketball, as well the minor league IHL Admirals, the NPSL Wave and the AFL Mustangs. A three sided marquee sits outside on the corner of a large public plaza - two sides have dot matrix boards and the third is a video board. Once you enter the building you walk into a large entry pavilion with high ceilings and dramatic views of the outside. The pavilion is smartly decorated with balloon arches in Bucks colors, high tech video boards hanging high above, and colorful banners as well as decorative planters with bright foliage. A grand staircase and escalators take you to the concourse levels. Although this atrium is nowhere near as large as our own at HSBC Arena, it is a very warm and appealing public space. As we entered the building, we were serenaded by a full orchestra playing oldies and swing tunes. The seating bowl is laid out in three levels - lower, suite and upper, each with its own concourse. A four sided jumbotron board is in the center, and two huge video board hang from the rafters at each end zone. There are dot matrix information boards along the balcony, along with stationary back lit ad panels. The ad panels on the center scoreboard are changable, and one cool and unique thing that we noticed... there were four ad panels above the scoreboard shaped like a CAN. The ads scrolled various Pepsi and Miller products. The Bucks herald their one NBA championship and then list 7 retired numbers on one banner. Marquette's centerpiece other than its titles is the one banner honoring the great Al McGuire. If you like beer, skip the regular stuff and try the local brew -Leinenkugel Red, available on tap at all the concessions. This is Milwaukee, the beer capital, and sampling their great brews is an absolute must! There is no team store, but there are several huge merchandise kiosks on each level with ample counter and display space. Things That Caught Our Eye - "Don't wave - Dance!". The Dance Cam exhorts people to do their shtick on camera and for the most part the fans obliged. The cheerleaders, male and female, manned the exits as the fans departed and thanked people for coming and wished them a good trip home. THAT is being fan friendly! Again we mention a dramatic outdoor marquee as a great suggestion for the outside of HSBC Arena. The Milwaukee Bucks are coming around.. the team is playing well for the first time in many years and might make some noise in the playoffs, and this city is getting excited. Also, MILLER PARK, Milwaukee's beautiful new retractable roof stadium, is slated to open in April after a year's delay. We checked the place out during our visit and this is going to be one terrific baseball experience! So basically Milwaukee is one great place to be right now if you are a sports fan. Of course, WE will be back this summer to visit the ballpark, enjoy some sizzling bratwursts and cold beers and enjoy an evening of Brewers baseball in one of MLB's hottest new venues. We can't wait! The Bradley Center arena gave the Milwaukee Bucks $6.5 million in financial aid in the venue's 2005 fiscal year. The venue's board has been working to support the team which has struggled to boost revenue in a building it does not control. The not-for-profit arena purchased $2.1 million in luxury suite tickets last year, which is part of the aid package. With the money given to the team, and $2.8 million in depreciation, the arena showed a $3.9 million loss. According to the financial report, gross revenues totaled $22.4 million in fiscal 2005, and operating revenues decreased from $17.9 million to $17.6 million. Steve Costello, the Bradley Center's president and chief executive officer, said the revenue drop was because of declining attendance at Bucks' games during the 2004-'05 season and no playoff appearances. Bucks' attendance has rebounded in the current fiscal year, and the team is headed for a playoff appearance this season. On the bright side, the Bradley Center had the best concert year in its history in fiscal year 2005, and it expects to have a big year when the current fiscal year ends June 30, Costello said. Building officials say the arena cannot continue to meet the Bucks' needs and the community should begin thinking about a replacement. Until then, the arena's board has approved a $4.5 million loan to make improvements. The money has not been borrowed and the board is in talks with the Bucks about a new lease. The Bucks are seeking a short-term agreement while the arena is looking for a deal lasting three years or more. 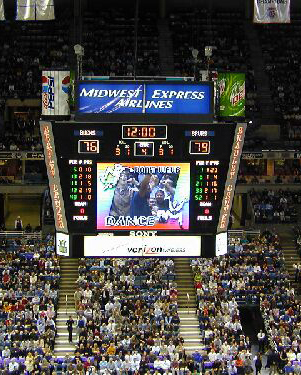 The Bucks pay no rent at the Bradley Center, and they receive all signage and sponsorship income. The Bucks receive operational support in the form of ticketing, building operations, event services, ushers, video services and custodial services. The Bradley Center also supports the AHL Admirals. For both fiscal year 2004 and 2005, the Admirals paid no rent for using the Bradley Center. The Admirals also receive free access to telecommunications, catering, ticketing, event staging and custodial services. The Bradley Center buys approximately $400,000 in suite tickets from the Admirals. Costello said the Admirals have a "largely rent free" agreement in the current fiscal year. Milwaukee, Wis. - Negotiations are continuing on a new lease between the Milwaukee Bucks and the Bradley Center, arena officials said. The current lease expired last week. For the past several years, the Bucks and Bradley Center have been going year to year on a new lease. Ulice Payne Jr., chairman of the Bradley Center board of directors, said both the board and the team expect the new lease will be for one year. Payne declined to discuss details but said a new lease likely would include some changes. "We need to look at some key terms in the lease," Payne said. "The Bucks know our financial position. They know it better than anybody." The Bucks do not pay any rent to the Bradley Center and, under the terms of the most recent lease, get a percentage of suite, food and other concession revenue. Last year, Payne said, the Bucks received roughly 27.5 cents of every dollar spent at Bradley Center events. In recent years, Bradley Center officials have made it clear to the Bucks and the building's other tenants that it has become increasingly difficult for the arena to produce new revenue. The Bradley Center board is working with the Lauth Property Group, an Indianapolis developer, to come up with plans for a mixed-use development on land the board owns around the arena. Those plans are progressing, Payne said. In addition, the board is interested in adding more parking for Bradley Center visitors. Steve Costello, president of the Bradley Center, also said the arena's scoreboard is nearing the end of its useful life. The scoreboard is 13 years old. Milwaukee, Wis. - Sen. Herb Kohl, owner of the Milwaukee Bucks, says a long-term arena solution is needed to prepare the franchise for its "next generation." "The Bradley Center issue will begin to surface more and more, in terms of when are we going to get Bradley Center II," Kohl said. "When is that next building going to go up to ensure that the Bucks will be here for another generation? "It's real; it's an issue. Now it's not a burning issue, because no one is suggesting we're leaving. That's not true. But it's an issue that needs to be addressed, and playing good basketball and winning games has a lot to do with addressing it successfully." Kohl acknowledged the slumping economy makes it a difficult time to think about a new arena for the Bucks, but he compared his team's needs to those the Milwaukee Brewers faced before Miller Park was built. "I don't think anybody regrets building Miller Park," Kohl said. "Our team is an important part of our community and our state, like the Brewers and the Packers. "No one is saying we need to start talking about it today. This is a tough economy and people are hurting. Nobody is thinking about public funds or even private funds with so many companies hurting at the moment. Milwaukee, Wis. - Gov. Jim Doyle has included a provision in the state's capital budget seeking $5 million in state bonding support to upgrade the Bradley Center. The request calls for $500,000 a year in state bonding authority for 10 years, for a total of $5 million. The Bradley Center told state officials it has maintenance needs totaling $23 million. While the $5 million would be state supported, the Bradley Center has agreed to raise the remaining $18 million. In the meantime, the building is in need of an upgrade and maintenance, according to a fact sheet distributed by the Bradley Center. The lengthy list includes: outdated mechanical and heating, ventilation and air-conditioning equipment; an outdated scoreboard; a deteriorating roof and exterior fa�ade; an obsolete hockey rink system; outdated event production technology; aging and inefficient lighting; and a significant number of seats that need to be replaced or refurbished. Milwaukee, Wis. - The Wisconsin legislature appears poised to provide $5 million for upgrades to Milwaukee's Bradley Center arena. Venue officials originally sought the funding over 10 years, but now believe that getting the money at once allows them to address issues dealing with the building's electrical and air handling systems. More energy efficient lighting will also be installed. The work is park of a total $23 million plan for upgrades that include a new scoreboard and ice system and refurbishing or replacing 18,000 seats. The balance of the work will be funded with private money. The building hosts the NBA Bucks, owned by U.S. Senator Herb Kohl. Kohl's most recent Senate financial disclosure report shows that he received $81.7 million in gross receipts from the team, which is slightly more than $2 million more than in 2007. In 2007, Kohl reported gross receipts of $79.5 million. In 2006, he reported $77.7 million, and in 2005, he reported gross receipts of $68.7 million. Kohl's latest filing also makes mention of loans he incurred from the NBA's credit facility back in 2003. There is no mention in the filing whether Kohl borrowed more money from the same credit facility in 2008. A Bucks team official declined to confirm or deny whether the Bucks borrowed from the facility last year or this year, as many teams have done. Milwaukee, Wis. - The outgoing chairman of the Bradley Center board of directors says the Bradley Center, home of the NBA Bucks, has about eights years of useful life left. Opened in October 1988, the Bradley Center has no public-tax support. Ulice Payne, who has told Gov. Jim Doyle that he wants to step down as chairman but will serve until a replacement is found, has been saying for years that the community needs to discuss the possibility of a new arena for the Milwaukee Bucks, the Milwaukee Admirals, the Marquette University Golden Eagles and the Milwaukee Iron arena football team. In his remarks to a student group, Payne said the scoreboard at the arena is 14 years old. Among arena scoreboards, that is ancient. Payne also said that maintenance crews on average replace 1,000 ceramic tiles inside the arenas. Most arenas do not even have ceramic tile. The Bradley Center does. Earlier this year, the Bradley Center produced a fact sheet detailing the other issues facing the arena. They include outdated mechanical and heating, ventilation and air-conditioning equipment; a deteriorating roof and exterior fa�ade; an obsolete hockey rink system; outdated event production technology; and a significant number of seats that need to be replaced or refurbished. Payne acknowledged that, despite his efforts to get a conversation going in the community about the future of the Bradley Center, no one has taken him up on it. The state is providing some help. In the recent state budget, $5 million in bonding was provided to the Bradley Center for maintenance purposes. Milwaukee, Wis. - Milwaukee Bucks owner Sen. Herb Kohl says a replacement is needed for the Bradley Center, but he realizes now is not the time to bring the issue to taxpayers. The Bucks, he said, remain committed to Milwaukee and are in the midst of rebuilding a team that hasn't been in the playoffs since 2006. Personally, Kohl, who is 74, says he is in no hurry to sell the team. "I don't have a calendar on it," he said. "I recognize the realities. But I'm not thinking that needs to be addressed immediately." The future of the franchise, he said, depends on a new collective bargaining agreement with the players' union, a meaty revenue-sharing program and, perhaps some day, a new arena. Locally, he said, the Bradley Center will have to be replaced, but not just because the Bucks need a more competitive venue. "At some point, Milwaukee needs a venue for the next 25 years," he said. "Not just because of the Bucks, but because we compete for events with cities all over the country. Everybody understands you have to be competitive in the marketplace." Kohl is keenly aware that some fans and taxpayers have suggested that he should build or put a down payment on a new arena with his personal wealth. But Kohl, who gives to a wide range of charities and donated $25 million to help build the Kohl Center on the University of Wisconsin campus, disagrees. "I really don't think about it in that way," he said. "Maybe they think about the Kohl Center in Madison. I made a major contribution. It seems to me that this should be a community decision, and it should be dealt with in that way. It shouldn't be a single individual who is expected or hoped, whether it's me or somebody else, to provide the funding for it." The senator also knows taxpayers are in no mood to talk about a new arena now. "This is not the time to try to get down to the actuality of how it will get done," he said. "We are living in a weak economy right now, both public and private. People are hurting and governments are hurting. To raise the issue and try to get to a conclusion right now would not be productive. It's unfortunate, but it's reality." Kohl also is hopeful that a new league revenue-sharing plan will be put into place that will help the Bucks stay competitive. For the past few seasons, small-market owners such as Kohl have lobbied for change. There is a modest revenue sharing program in place now, Kohl said, but it's not enough. That could change in the years ahead. Milwaukee, Wis. - Milwaukee's Bradley Center reported a $4 million loss in its last fiscal year, a figure that includes $2.9 million in depreciation. The figure was $1.9 million more than 2008. Operating revenue - the sale of tickets, parking, food and beverage merchandise - totaled $13.2 million, down more than 12 percent from $15.1 million a year ago. Steve Costello, president of the Bradley Center Sports & Entertainment Corp., said the arena booked 167 events in the year and drew about 1.5 million people. Attendance held up well, he said, although attendance at non-team events was down. Moreover, consumers spent less once they got through the turnstiles. The Bradley Center remains in stable financial condition and is planning some upgrades, including a new scoreboard coming next summer, Costello said. Costello said the arena experienced a decline in the suite and premium services business. That happened for two reasons: Businesses cut back because of the overall economic climate, and demand for suites has changed in favor of other premium seating. Arenas, like outdoor stadiums, are cutting back on the number of suites for lease. The Milwaukee Brewers have cut back on suites at Miller Park and have converted space to party suites. So, too, has the Bradley Center. There are fewer suites because some have been collapsed and converted to club areas. The end-of-the-fiscal-year report said the Milwaukee Bucks, the center's major tenant, received $4.8 million in shared revenue in fiscal 2009. In addition, the Bradley Center purchased suite tickets from the Bucks for $2.1 million. The Bucks do not pay any rent to the Bradley Center and, under the terms of the year-to-year lease, get a percentage of suite, food and other concession revenue. Bradley Center officials have said in the past that the Bucks receive roughly 27.5 cents of every dollar spent at Bradley Center events. The Bradley Center plant fund has dipped to $3.2 million, from $3.5 million. The state Building Commission was given authority to grant up to $5 million to the Bradley Center for improvements. The Bradley Center board will be making decisions in the next few months on how to use that money, Costello said, but a new and better scoreboard would be replaced in time for next basketball season. Milwaukee, Wis. - The Milwaukee Bucks have signed a new one-year lease with the Bradley Center and the team will continue to use the facility rent-free, according to the Milwaukee Journal Sentinel. At all events held at the Bradley Center, the Bucks receive 27.5 percent of concession sales and 13.75 percent of food beverage sales in the suites. The team also receives 30 percent of all merchandise sales at Bucks' games, the newspaper reported. The Bradley Center also announced that it would construct 10, four-seat theater boxes, all of which would be connected to a new private dining and lounge area, for the upcoming season. The new theater boxes will be located on the suite level next to Club Cambria, located on the north end of the building. The new offering is intended to provide corporate customers and fans more options beyond ones already available at the arena, the newspaper said. Besides Club Cambria, the arena offers the Palermo's Courtside Club, the Miller Lite Home Court and other smaller club options. The theater boxes will reportedly include four seats with more leg room. The package being sold will include reserved seating in the adjoining private lounge with beverage service and buffet dining; tickets to sporting events; and parking. The Bradley Center in Milwaukee is no longer working on plans with Indianapolis-based developer Lauth Group to create shops and restaurants north of the downtown sports and entertainment arena, the Milwaukee Journal Sentinel reported. Lauth in May 2008 released conceptual plans that included over 500,000 square feet of retail on 12 acres adjacent to the Bradley Center. Lauth planned to develop the project in phases, and its longer range proposal envisioned a possible hotel, offices and condo or apartment towers - including some development spilling into the vacant Park East area. Lauth began marketing the initial phase to shop and restaurant chains, in hopes of landing enough commitments to obtain financing for the project. A weakened economy reportedly scuttled the project, the newspaper said. Milwaukee, Wis. - A prominent Milwaukee business leader said the community needs to discuss "at an appropriate time" the idea of extending the Miller Park ballpark sales tax as a way of funding a new arena for the Milwaukee Bucks, the Milwaukee Journal Sentinel said. Timothy Sheehy, leader of the Metropolitan Milwaukee Association of Commerce, a pro-business group, floated the idea at a civic forum. The idea of extending the ballpark sales tax is not new, but it has never gained political and civic traction in a time of budget deficits, anti-tax sentiment and a struggling school system, the newspaper said. Sheehy said he already had begun to form a group of business leaders who have been meeting informally on not only possible extension of the 0.1 percent stadium sales tax as a means of financing a new facility, but other options. The group also wants to see if there's a way to sell naming rights at the Bradley Center's various entrances without giving up the name of the arena. Sheehy did not disclose the names of the business leaders to the newspaper, and added that Bucks and Bradley Center officials were aware of the task force. Sheehy repeated what Bradley Center officials have been saying for years: The arena, built in 1988, is aging and is not capable of generating new revenue for an NBA franchise. A new facility is needed, he said. "This is not a next-month problem," Sheehy said. But the shelf life of the Bradley Center, he said, is measured over the next five or six years, and Sheehy and others have talked more openly about finding a solution before the problem becomes too intractable. The Bradley Center was donated by the late Jane Bradley Pettit in memory of her father, Harry Lynde Bradley. Built for only $90 million, it is now one of the oldest arenas in the NBA. The Miller Park sales tax generates about $24 million a year to repay Miller Park construction debt. Mike Duckett, the district's executive director, told the Journal Sentinel that his board was dedicated to ending the tax as soon as possible. Consultants hired by the district have said that, depending on the health of the economy, the sales tax could end as soon as 2016 or possibly as late as 2018. Extending the ballpark sales tax for a different purpose also would require a change in state law. The law authorizes the Miller Park district to collect the tax for a ballpark . The law would have to be changed to dedicate the tax revenue toward an arena, Duckett said. Gov. Scott Walker, who rejected a budget request for a $10 million loan for work at the Bradley Center earlier this year, has said he prefers renovation. He also said he is against taxpayer bonding for the facility at this time. Walker also will have a say on the stadium district board. Walker has six vacancies to fill on the Miller Park board. The terms of those six members ends in July. Milwaukee, Wis. - Wisconsin Gov. Scott Walker and Milwaukee County Executive Chris Abele both are opposed to extending the Miller Park stadium sales tax to help build a new arena for the Milwaukee Bucks, the Milwaukee Journal Sentinel reported. Milwaukee Mayor Tom Barrett told the newspaper he considered the idea, floated by Timothy Sheehy, the head of the Metropolitan Milwaukee Association of Commerce, as "a dead issue" as soon as Walker announced his opposition. Sheehy raised the possibility at a civic forum, in part to jump-start a community-wide discussion on the Bucks' future in Milwaukee, and finding the best way to build a new facility. Cullen Werwie, Walker's spokesman, told the Journal Sentinel the governor was opposed to extending the 0.1 percent sales tax, which is collected in Ozaukee, Washington, Waukesha, Racine and Milwaukee counties. The tax has been collected since 1996. It was Walker who rejected a request from Bradley Center officials for a $10 million loan that would have been used for maintenance and renovation work at the arena. Abele sided with Walker, his predecessor. "That's not something I would support," Abele said, adding, "I like the Bucks. I'm a big fan of a new arena." Barrett said he was surprised by Sheehy's suggestion. But he said he supported Sheehy's call for local leaders to come together to debate how to fund a new arena. Extending the sales tax would require a change in state law that would allow proceeds from the tax to be used for another purpose. Under current law, only the Miller Park stadium district can receive the proceeds from the sales tax. Members of the Miller Park stadium district have been on record as saying they are dedicated to ending the tax as soon as possible. Consultants hired by the district have said the tax, used to pay for the financing and construction of Miller Park, could end as soon as 2016 or as late as 2018. Milwaukee, Wis. - What the Milwaukee Journal Sentinel calls a small group of influential business leaders and the Milwaukee Metropolitan Association of Commerce have talking in earnest about a campaign to provide support for the Bradley Center and its biggest and most important tenant, the Milwaukee Bucks. At this stage, any formal campaign in behalf of the Bradley Center is months away, according to Timothy Sheehy, MMAC's president. For now, the group is in the process of finding ways to encourage MMAC members to look for sponsorship opportunities at the Bradley Center or buying tickets or suites at Bucks' games. The nascent campaign - with a target of $2.2 million in sponsorship, ticket or suite sales - has the support of both the Bradley Center and the Bucks. "This is an ongoing discussion which is focused on closing the gap between what the Bradley Center is operating with now and what they need to be viable," Sheehy told the newspaper. "Right now this amounts to looking at the BC and recognizing that it needs a greater level of support from the community." 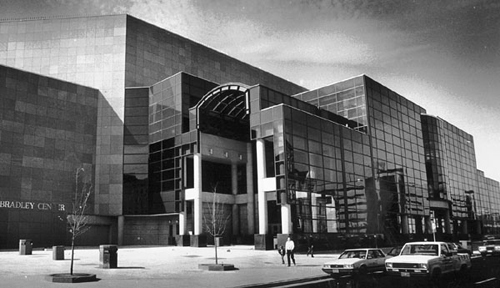 Opened in 1988, the Bradley Center was built with a gift from Jane Bradley Pettit in memory of her father, Harry Lynde Bradley. That single act of philanthropy, however, created a problem as there is no public tax support for the facility and the arena's ability to generate new revenue becomes more challenging each year. The newspaper said the most recent fiscal report, released last December, stated that the Bradley Center had operating revenue of $14.8 million for the year ending June 30, 2010. Most troubling is the Bradley Center's plant fund � money set aside for improvements. It was at a minuscule $2.1 million then, and hasn't budged since, Bradley Center officials say. In general, the Bucks account for 40 percent of the annual gross revenue at the Bradley Center. For years, Bradley Center officials have said that they face a long-term challenge of finding ways to generate additional revenue to meet ongoing maintenance and operational needs. Sheehy says he hopes something can be done about that. "How many years can you say finances are the same or worse?" Sheehy said. "That's the basis for the discussion in the community." Marc Marotta, chairman of the Bradley Center board of directors, said he welcomed the help. The Bradley Center, he says, annually brings in 1.5 million to 1.6 million people a year and stands as a cultural and sports institution alongside other prominent attractions. Marotta said that, even without the MMAC's assistance, the Bradley Center is working to develop new revenue streams on the operations and maintenance side. "This is clearly a determined effort by MMAC's leadership," he said. "We want to work to extend the life of the building until we can give the community a chance to decide on a new building." Bucks Vice President Ron Walter said that the MMAC's move primarily was directed toward the Bradley Center. "It's all part of an ongoing effort that we support," he said. The prospect of a new arena has been discussed for years, but even the Bradley Center's most dedicated supporters know that public tax support for a new arena, especially in the current political climate, is dead on arrival. Milwaukee, Wis. - The Bradley Center and the Milwaukee Bucks have reached agreement on a new one-year lease that covers last season, but the Milwaukee Journal Sentinel says the deal also contains a provision in which the NBA team won't get any money until professional basketball resumes. The Bradley Center owes the Bucks $9.5 million. But in the new agreement, those payments have been extended further to as late as 2019. The agreement is a reflection of reality given the inability of the players' association and NBA owners to find a way to end their lockout, as well as the Bradley Center's own challenged financial condition, the newspaper said. The new Bradley Center-Bucks agreement establishes a prorated payment plan on all concession, catering and suite-shared revenue payments to the Bucks based on the actual number of games played. At all events at the Bradley Center, the Bucks receive 27.5 percent of concession sales and 13.75 percent of food beverage sales in the suites. The team also receives 30 percent of all merchandise sales at Bucks' games. Also, the Bucks pay no rent at the facility. The new lease, actually the old lease, covers the period from Oct. 1, 2010 through Sept. 30 of this year. It basically leaves unchanged most lease terms and conditions relating to suite, concessions and revenue sharing. Steve Costello, president and CEO, said the new provisions in place could be revisited or revised if and when the lockout ends. Marc Marotta, the chairman of the Bradley Center board of directors outlined in a statement the challenges for an arena already struggling with finding new ways to generate revenue and now facing the loss of significant basketball revenue because of the lockout. "The Bradley Center must in the short term identify and secure new sources of revenue to maintain the building and extend its life for the benefit of the community, while also doing all it reasonably can do to contribute to the viability of each of our sports teams, particularly our main tenant, the Milwaukee Bucks," Marotta said. The Bucks generate 40 percent of all revenue at the Bradley Center. In addition to the Bucks, the arena is the home of the Milwaukee Admirals, the Marquette University men's basketball team and the Milwaukee Mustangs, an arena football team. The Journal Sentinel said a good indicator of the Bradley Center's challenges is its own plant fund, a sort of piggy bank it maintains for ongoing maintenance and repair issues. The fund has been dropping for years and now stands at $2.1 million. Milwaukee, Wis. - The Milwaukee Journal Sentinel says that thanks to state financial assistance, the Bradley Center reported that operating income in the fiscal year that ended June 30 totaled $16.3 million. That compares with operating income totaling $14.7 million the year before. Bradley Center officials pointed out that the arena's financial condition would have been worse, if not for $5 million from the state for capital repair and maintenance. That aid, the first public money the Bradley Center has ever received, is expected to be exhausted in 2012. Including an annual depreciation expense of $2.6 million, the Bradley Center reported a loss of $300,000 last year, an improvement of $1.7 million. Since the building opened in 1988 as a $90 million gift from the late Jane Bradley Pettit, officials at the Bradley Center have invested $60 million to maintain the building. A total of $6.3 million of those improvements were completed in the last fiscal year. But that investment and the arena's inability to generate significant new revenue or any measure of public funding have Bradley Center officials talking openly about the need for a new arena. Marc Marotta, the chairman of the Bradley Center board, and Steve Costello, the arena's president, say the Bradley Center has a useful life span of five to seven more years at which time they hope a new home for the Milwaukee Bucks and the other major tenants, including Marquette University, the Milwaukee Admirals and Milwaukee Mustangs, can be opened. At this time, however, no specific financing plan has been put forward. "The next five to seven years, there has to be a public-private effort, a partnership, to get us from today until that time when there's an appetite for a new facility, however that may be financed," Marotta said. Marotta said the Bradley Center would reach out to members of the Legislature, the city, county and the business community for support. The newspaper said "underscoring the financial challenges the Bradley Center faces is that it owes the Bucks $9.56 million. Some of that money has been deferred for several years with the approval of Bucks' team owner U.S. Sen. Herb Kohl. In addition, the Bradley Center paid the Bucks $4.8 million last year." The Bradley Center reported that it has $8.8 million in debt owed to BMO Marshall & Ilsley Bank. That bank debt reflects $2 million in new borrowing that was used to supplement the $5 million from the state for capital maintenance and repair. Milwaukee, Wis. - U.S. Sen. Herb Kohl, the owner of the Milwaukee Bucks, said that the time is now to find a way to finance and build a new arena to replace the Bradley Center. And for the first time, according to the Journal Sentinel, he said he was willing to make a personal financial commitment toward a new facility, an amount he said would not be insignificant. "We're no longer talking about in terms of some point in the future," Kohl said at the team's Cousins Center practice facility. "We're talking about plans to get it done." Kohl, who has owned the team since 1985, said the franchise was working on plans for a new facility to replace the aging Bradley Center, though he said no site is under discussion. "We are actively working on it, and we'll get it in high gear, I hope soon, on trying to accomplish our goal," he said. Kohl said he could not speculate on how an arena to replace the Bradley Center, opened in 1988 and now considered to be one of the oldest facilities in the National Basketball Association, would be financed. But he said it would probably be a combination of public and private funds. Kohl conceded it would not be easy to come up with a plan, but pledged his support to make it happen. "There is a need to get going on it and get it done," he said. Kohl, 77, is one of the wealthiest members of Congress. Among his many charitable efforts, he donated $25 million to build the Kohl Center on the University of Wisconsin-Madison campus. Kohl said he would not speculate on the political dimensions of finding financing and getting approval for a new arena. He said he had not talked to any political leaders, but said other communities had been able to find ways to finance and build a new facility. He specifically cited the experience in Green Bay, where the Green Bay Packers were able to convince community leaders of the need to expand Lambeau Field. The $295 million project, funded in part by a sales tax in Brown County, was completed in 2003. "I believe we will have a shot at getting it done," he said. "The maximum effort will be put forth not just by the Bucks, but by the business sector and the public sector." He said NBA commissioner David Stern and other league officials were happy Milwaukee wants to keep the Bucks in town. "The league is cooperating with us," Kohl said. "They are happy to see that we want to make the effort. They support that. They are wanting to see us get it done. And I think that's good and sufficient. They don't oppose our desire and wish to make the effort to stay in Milwaukee." Kohl said people understood there was a limited lifespan for the building. And he said people understood the ability of the Bradley Center to generate new revenue for its tenants, including the Bucks, was limited. "Does the league know that? Yes, they understand that," Kohl said. "And they probably would say, if they were sitting here, that without a new facility, Milwaukee's chances of remaining a part of the NBA are not robust." Asked about his ownership of the team, Kohl said that, like other owners of professional sports teams, he is approached "several times a year" by people who might be interested in buying in or taking it over. "Our franchise is no different than any other in that respect. I've had inquiries from several people over the years who would be interested in buying a part or all of the team. But that's not unusual in the sports business," he said. Marc Marotta, chairman of the Bradley Center board of directors, called Kohl's comments a "positive development." "Our first priority is to solidify the Bradley Center today so that discussion we need to have on a new arena is a meaningful discussion. It's important that we build this bridge from now to five or six years from now."